Sea Mills is an inclusive, mainstream school that provides a safe, supportive and challenging environment. We want all children to reach their full potential, regardless of their special educational needs. Our Inclusion Leader is Lorraine Swords and our SEN governors are Mrs Teresa Lloyd and Mrs Jenny Short. The following information might answer some of your questions. If there is anything else you want to know, please contact us. Please view our SEND Policy here. What should I do if I think my child has special educational needs? If you feel your child may need some extra support in school, please talk to their teacher about your concerns. Or, you can arrange see the SENCO directly to discuss their needs. We strive to have open and honest relationships with our families and would hope that you feel confident in talking to us about the support you feel your child needs. How does the school know if a child may need extra help? At regular Key Stage Team Meetings, staff discuss the progress and attainment of all children in the school. They can refer any child they feel may have additional needs to the SENCo for further discussion. Children we feel have special needs will be placed on an SEN register. You will be informed if we do this for your child. The school will always talk with you if we feel your child may have additional needs and will gain parental consent before any referrals are made to outside agencies. How can I support my child at home? We offer an open door policy. You are welcome to make an appointment to meet with your child’s class teacher or the SENCO any time to discuss how your child is getting on. We will offer advice and practical ideas for how you can support your child at home. Your child’s teacher will regularly set homework tasks and update the website to show what work the class has been doing and how parents can support at home. We also hold regular parent information sessions on supporting your child with their learning. There are also regular Family Learning Conferences where your child’s teacher will share ideas about ways you can help at home. How will my child be taught and supported? Our SENCO oversees all the support that is offered to children requiring additional help across the school. Your child’s class teacher will oversee, plan for, and work with, each child with additional needs in their class, to make sure they are making progress in every area of the curriculum. They will follow the guidance of medical and outside agency professionals to make sure they are giving the best support they can. You child may have a Pupil Passport, which will identify barriers to their learning and useful strategies being used to support your child. There may be an LSA (Learning Support Assistant) working with your child, either individually or as part of a small group. Different LSAs may work with your child throughout the day, depending on which intervention they are doing. LSA time is carefully timetabled and states the support to be given to individuals and groups of children. How will I know my child is doing the right sort of work? Teachers will use their knowledge of your child to plan work which is just right for them. They will make sure there is sufficient challenge and support, sometimes providing different activities for small groups. The teacher will also direct any other adults in the room, such as LSAs, who are working to support your child. The class teacher and SENCO will decide, at least three times a year, which interventions children need to do to support their learning and progress. This will usually happen at the beginning of terms one, three and five. If your child is receiving an intervention, a letter will be sent home to inform you at the start of term. In a very small number of cases, children may follow individual programmes of work for parts of the school day. How are the schools resources allocated and matched to meet children’s needs? We see that the needs of all children who have special educational needs are met to the best of the school’s ability with the funds available. The Senior Leadership Team make sure the budget is fairly spent, with the children who have the most complex needs, being given the most support, often involving an LSA. This spending is reviewed by the governors. In some cases, the school will apply for extra funding – Top Up funding – to make sure we can supply the support your child needs. You will be told about any extra funding the school has for your child and how it is spent. How is the decision made about what type, and how much support my child will receive? The class teacher, along with the SENCO, will discuss the child’s needs and decide what support it would be appropriate to put in place. The SENCo reviews the SEN register with class teachers on a termly basis and checks the support children are having. Your thoughts and views are always welcome in this matter and will be invited to regular meetings to review, with us, the support your child is having and the impact it is making. How will you, and I, know how well my child is doing? Teachers regularly assess children’s progress and compare it to school, national and personal attainment. They may use standardised tests and assessments to make their judgements. You will have the chance to meet with your child’s teacher at least twice a year, when you can discuss and find out about the support your child will be having and the progress they are making. You will also receive a letter detailing the extra interventions your child does at the start of term 1, 3 and 5. If your child is on the SEN register, they may also have a Pupil Passport, showing the strategies and support being used. If they are accessing an intervention, this will be planned and monitored on an IRAM by the adult leading the intervention – this will be discussed with the class teacher and regular feedback provided. If your child has meetings with outside agency staff, such as Occupational Therapists or Speech and Language support, then you will be invited into school to meet them and see how their suggestions are being carried out in school. Some children may have multi-agency meetings where many different staff from a variety of outside agencies meet to discuss progress and decide the best ways to support. You will always be informed and invited to these meetings as your views and thoughts are vital to building a clear picture of the child. If your child’s teacher has concerns during the year about the progress your child is making, they will contact you to discuss these. How will we know if the support that’s been put in place is working? By reviewing children’s targets on their IRAMs and ensuring they are being met. By checking if the child is making progress academically against personal and national/age related expectations and the gap is narrowing – they are catching up with their peers or age related expectations. By reviewing the strategies on the Pupil Passports to see how effective they are. We also use the assessments of outside agency staff, such as Speech and Language Therapists to see how children are progressing in certain areas. Children may move off the SEN register when they have ‘caught up’ or made sufficient progress. How will my child be included in activities outside the classroom, including going on school trips? Every child is included in every aspect of the curriculum and we aim for all children to be included on school trips. We will provide the necessary support to make sure this can happen. A risk assessment is carried out before any off site activity to ensure everyone will be safe. For some children with specific needs we carry out an individual risk assessment in September and before a visit. In the unlikely event that it is considered unsafe for a child to take part in an activity, then alternative activities which will cover the same curriculum areas will be provided in school. At Sea Mills Primary School, we believe that all children should feel safe, have their basic needs met and be made to feel special in school, regardless of their individual needs. We therefore place a high importance on children’s well-being and work to support this in many ways. The class teacher has overall responsibility for the pastoral, medical and social care of every child in their class. Your child’s class teacher is therefore your first point of contact if you have concerns about your child’s well-being. If further support is required the class teacher liaises with the SENCO. This may mean involving outside agencies. We will always seek parental consent before we make referrals to outside agencies. The school also has a Pastoral LSA and Family Support Worker who are able to support all children (including those who could be termed as vulnerable) and their families during the school day. Both of these adults are Thrive trained practitioners. We have a policy on the use of medicines in school and if your child needs a prescribed medicine, you will be asked to complete the relevant forms. Children with long term medical needs will have a care plan and if necessary, staff will be given training on how to best support a child. What support is there for behaviour, avoiding exclusion and increasing attendance? If we have concerns about your child’s behaviour, we will talk with you to find ways to support them in school. Attendance of every child is monitored by our Pastoral LSA. Lateness and absence are recorded and reported to the Head Teacher. If parents are struggling to get their children to school regularly and on time then we offer support through our Family Support Worker or Pastoral LSA. We also have a Breakfast Club and After Cool Club which provide more flexibility of child care for parents and can help with lateness issues. How will my child be able to contribute their views at school? Our School Learning Council gives a chance for all children to share their ideas and views on the school community. Our Family Learning Conferences are also a place where children can discuss their attainment and progress with both you and their teacher, and consider how they work towards their targets and next steps. Where appropriate, children will contribute to their Annual Reviews by reviewing their achievements and state their own views on the additional help they have received. Our school is fully wheelchair accessible and we have facilities for disabled children and staff. We are a one floor school and there is flat access to all areas of the school. There are two accessible toilets on site – both are fitted with showers. Please see our Accessibility plan. We have a New Arrivals policy and strive to support children and families who come to Sea Mills from other countries or who do not have English as their first language. We strive to ensure a rich learning environment for all learners with positive role models and culturally wide images and resources. We support individual learning needs through using visual timetables and prompts, having off-white coloured papers and smart board screens and using coloured overlays for reading, where appropriate. We act on advice from outside agency professionals to adapt and tailor resources and facilities as needed on an individual basis. What training do the staff supporting my child have? Our teaching staff and support staff are highly skilled and trained in meeting the diverse educational and medical needs of children. The training they receive is ongoing and reflective of the needs within the school community. We are a Thrive school and use the language and guidance of this scheme to support and develop children’s emotional well-being. This is a whole school approach and some children are identified to have an individual or group support – you will be informed by letter if your child is starting this intervention. Staff will always follow guidance and advice from outside agency professionals. This is especially important when a child has a disability we may not have worked with before. How are parents involved with the school and how can I get involved? There are regular meetings for parents to discuss your child’s progress as well as regular newsletters, web site updates, blogs and other meetings and information sharing sessions throughout the school year. The School PTFA runs fund raising activities to support the children’s education through the year. The group is very welcoming and would always be happy for new parents to become involved or join in with events. There is also a Parent Forum where parents are able to share thoughts, views and ideas on school development. How will the school prepare and support my child when they join and or transferring to a new school? We encourage all new children and families to visit the school before joining us. If the family has English as an additional language, we will arrange for an interpreter to be at an early meeting, so we can fully explain school procedures and promote understanding of expectations. If a child with SEND is transferring to us from another setting we will always try to visit them at their current setting. If this is not possible we will liaise closely with the child’s current setting to ensure a smooth transition. 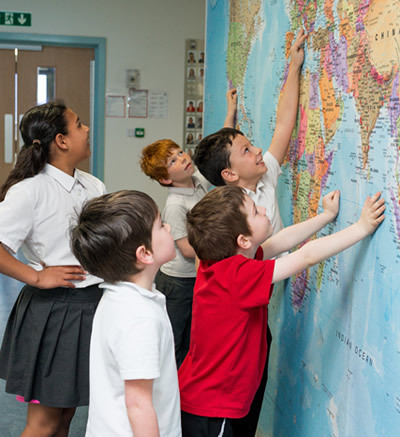 When children with SEND are preparing to leave us for a new school, typically to go to secondary education, enhanced transition arrangements are put in place. This may be extra visits to the school, visits from new staff and specialised activities. Even when children are transitioning from one class to another at the start of the school year, we are aware of the need for good transition and support for children. They will have times to meet their new teachers and LSAs and get to know their new rooms. You will also be invited to a ‘Meet the Teacher’ event so you can get to know your child’s new teacher and have a chance to discuss the support your child might need. We liaise closely with staff when receiving and transferring children to different schools ensuring all relevant paperwork is passed on and all needs are discussed and understood. If your child has complex needs or an Education Health and Care Plan, a meeting will be held to plan transition which we will invite staff from both schools and any outside agencies involved in supporting your child to attend. Who are the school governors involved and what are their responsibilities? The governors responsible for SEN are Mrs Teresa Lloyd and Mrs Jenny Short. The SENCO reports to the school governors three times a year to inform the governors about the progress of children with SEN; this report does not refer to individual children and confidentiality is maintained at all times. The governor responsible for SEN meets regularly with the SENCO and they also report to the governors to keep them all informed. The governors agree priorities for spending within the SEN budget with the overall aim that all children receive the support they need in order to make progress. Any complaints or concerns about the provision for SEN children should be made, in the first instance, to the SENCO and then to the Headteacher and then to the Chair of Governors.